This fabulous market is a hidden treasure right in the heart of the “golden mile”, the swankiest shopping neighbourhood in Madrid (or Spain even!) It’s called Barrio Salamanca and all the high fashion houses are within walking distance, along with lots of exclusive little boutiques. Despite this, Mercado de la Paz has elements of a traditional market, selling not only fruit, veg, meat and fish, but also boasting a locksmith, cobbler and garment repair stalls. 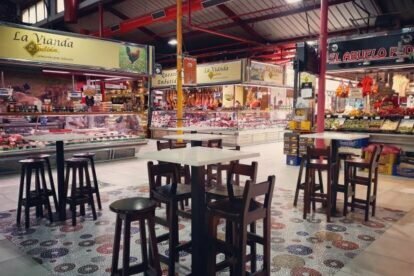 You can stock up on all the typical Spanish delicacies such as cured meats, olives, cheese and great wine too. It doesn’t end there – like many markets in Madrid, La Paz has been rejuvenated and modernized to now offer a range of little restaurants to entice clients to come here and eat lunch or have a snack, even if they don’t want to shop. “Casa Dani” is a classic, and has what claims to be the best tortilla (Spanish potato omelette) in Madrid. Now I haven’t eaten tortilla in every restaurant in town, but I swear, this is pretty amazing! They give a huge portion, it’s really juicy and I can’t say I’ve had better anywhere. They also have a really well-priced fixed price menu from Monday to Saturday. So if you want to shop (or just window shop) in this fashionable district, when you take a break, stop by Mercado de La Paz for a bite. You are unlikely to find many tourists here, and it’s a great spot for people watching too!